I've really got to get back to blogging. So here's a recap of Halloween. Mostly for the grandparents and extended family members. I do have some "useful" posts I'd like to get up, but alas....they sit on the back burner until I have more time. So on with Halloween....which is most importantly some boy's birthday in our family. So it's a crazy day around here. The night before I decorated cupcakes for Scooter's birthday (and Halloween) party in class. Chocolate cupcakes with swirled chocolate and vanilla buttercream frosting. With ninjas on top at the request of the birthday boy. The ninjas were not edible. But they were a hit in the class to play with. Luckily the party was at the end of the day or the teacher may have not been happy with me for providing toys to the kids. 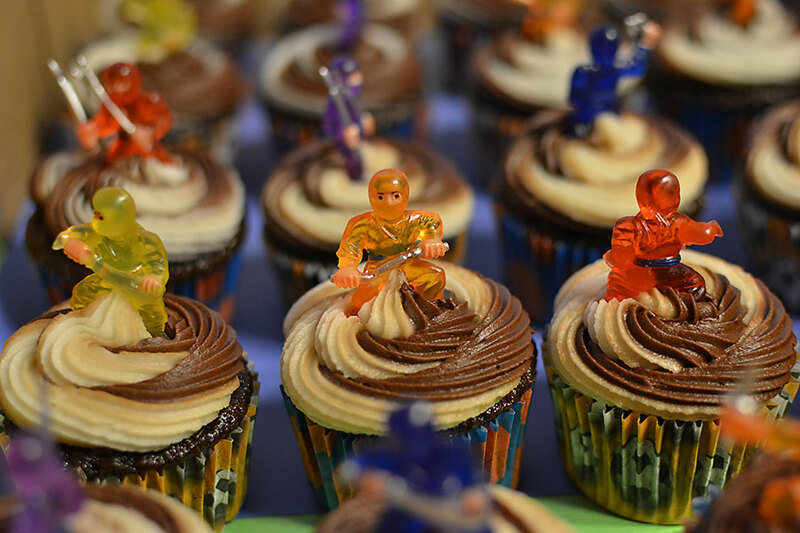 Oh...the cupcake papers and ninjas were from Oriental Trading Company. Good deals there on some things, just order early! 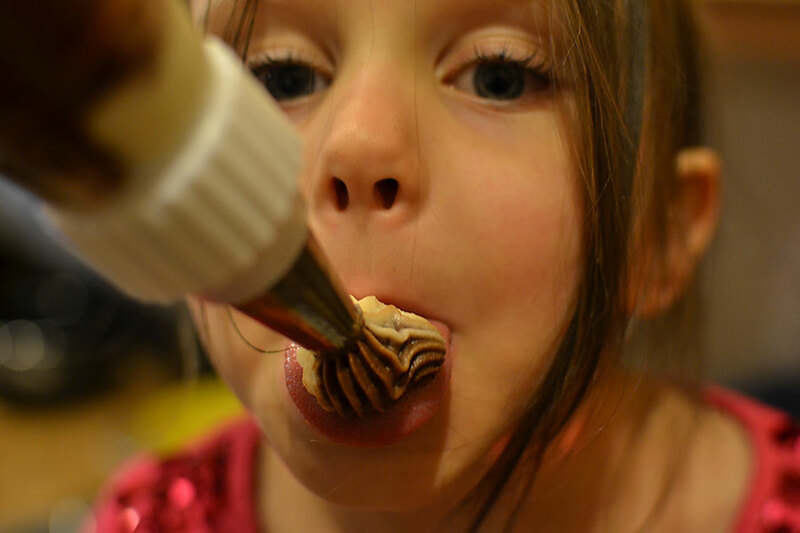 Anyone else decorate their kids' tongues with frosting? I remember my mom giving my siblings and I squirts of extra frosting on our tongues when we were little and she was decorating cakes. My mom is the best cake decorator! I'm happy to repeat that frosting tradition with my kids. And I'm happy to still partake in it myself. 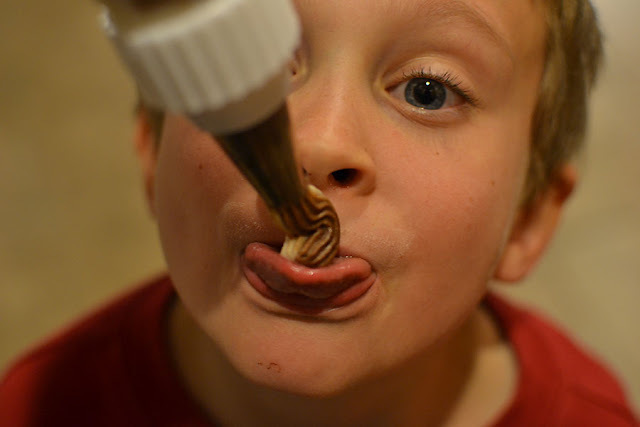 Except it's really hard to put frosting on your own tongue and take a picture of yourself. Maybe that's a good thing I don't have a photo of that! 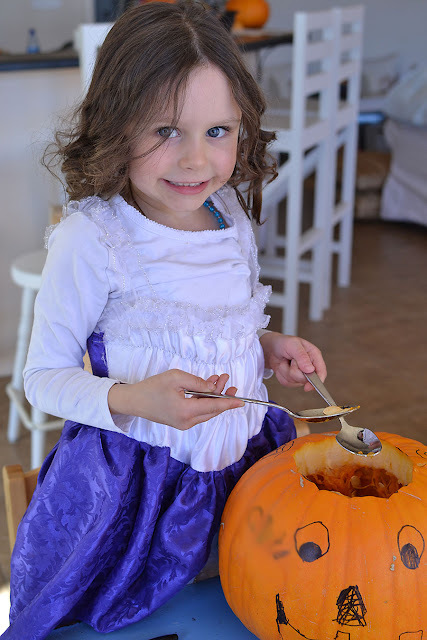 Halloween was only a half day of school for my kids. Thankfully. Cause we still had to decorate pumpkins. Scooter decorated the one he picked out on the school field trip to the pumpkin patch. Chewy decorated one that we grew. Yes...you read that right....we actually got 4 pumpkins from our garden this year. We had 7, but some lost their lives to naughty wildlife or another demise. And boom....we got 5 softball sized watermelons. That boom....we actually ate. Nothing like dropping garden bombs on you! I was so excited to actually grow stuff in the desert....especially since we rarely used well water to water them. We tried to extend the life of the water in our water barrels and we grew the stuff in some real dirt that we imported here. Oh...and I got three gourds that grew from ones we threw in our compost and then put in pots with our tomatoes. Love them little surprises. Wait...where was I going with this? Oh, pumpkin decorating. 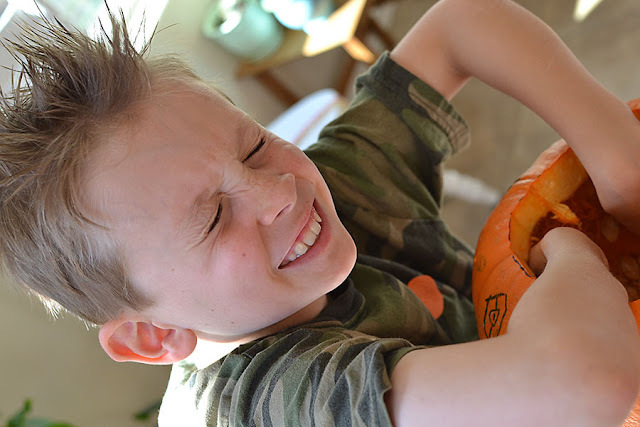 The kids just loved pulling out the pumpkin guts. Not really, I got to finish it. But we did end up with about 2 cups of seeds that I roasted from 2 pumpkins. Yummy! Oh...those curls on my girl above? I get asked about those a lot because my girl has naturally straight fine hair. Her hair doesn't hold curls very well with a curling iron or other ways. But this way....they stay through to the next day if we don't wash her hair. I'll show you how we do them sometime...except I always do it at night and never get a photo. Some time....some time...I'll try and show you....it's super easy. And the Birthday/Halloween evening finished off with wishing our boy a Happy Birthday. I couldn't do cake again. We had a frozen peanut butter pie that was delish! I made it from a recipe in Coastal Living . 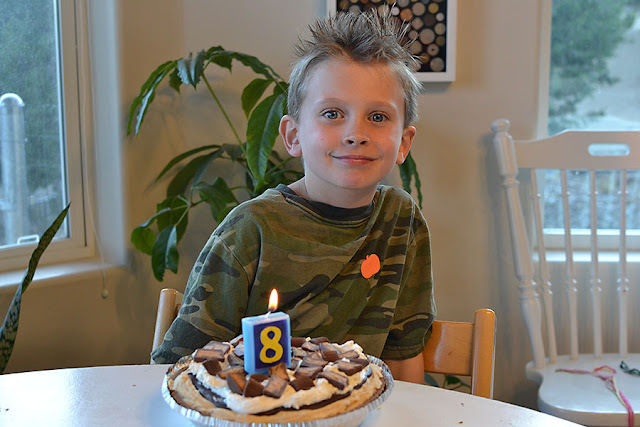 My boy is 8! I can't believe he's half way to driving and I've only got a decade more before he leaves me. *sniff* Why does it go so fast? I think I'm going to hold on to that boy all weekend and not let go of him. I love that boy. He's the most sensitive and caring boy. He hates to do things wrong. He's quite the little snowboarder and mountain biker! He's got the best of his daddy in him and I can see me in him. He's a loving big brother and most definitely a momma's boy. He's going to be a great man someday and right now I'm happy to keep him as my little man. Oh...we did do the trick-or-treating thing. I drive, Biker Boy takes the kids to the doors, and the dog comes along (dressed as a squirrel). We did maybe 6 houses and the kids have a huge bucket full of candy. (We got 9 trick-or treaters! I only witnessed 3, so maybe someone just took 6 bags of candy instead of 6 individual kids taking bags.) Chewy fell down on the gravel road after maybe the 4th house and it was a big tragedy. Blood and crying like crazy, mostly because she was tired and out past her bedtime. Trick or treating is dangerous. So how was your October 31? What did you do or not do?